I wanted to participate in Five Things Friday last week. I didn’t quite get it together. This week I’m juuuuuuuust sneaking in right at the end of day. Wanting to participate in this has helped me be more mindful of the quiet moments in life that bring me true life, in the midst of a lot of upheaval and chaos. I’m making my own list and adding pictures. What’s making you happy? Head to Gypsy Moon’s link-up to discover more happiness or share your own. This week’s recap post has taken me a little extra time to produce — apologies! 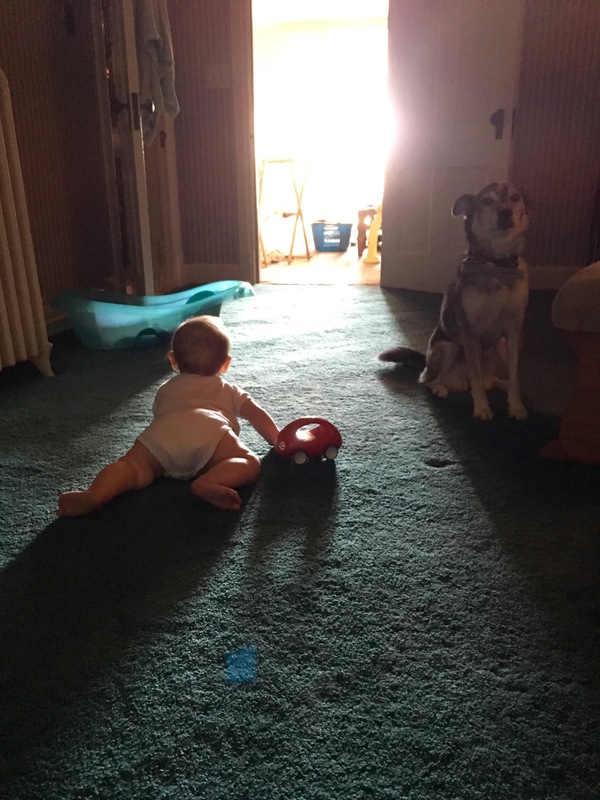 — both because I am part of it and because I am beholden to the vicissitudes of parenting a 7-month-old. I know many people parent babies full-time and sew and blog daily (and exercise and eat healthy and also get 8 hours of sleep a night), and to them I say, “kudos, you are doing an amazing job!” And to myself I say, “I get another glass of wine later for every time I say that.” Yesssssss. Sorry, I got distracted! The point of this post is that this week’s quilters are a group of outstanding veterans… and yours truly. Seriously, you’ll flip when you hear about how talented these quilters are. Check out their posts! Carole Lyles Shaw has been doing modern quilting since before modern quilting was a thing! Her colors are bold and beautiful, she does amazing improvisational work (including CURVES!) and she’s got one book out and one on the way. She also has a give-away going on right now, so check it out! Anne at Said With Love is an Aussie quilter with a love of text fabrics. Her quilts are bright and cheerful, and she’s working to make a quilt for every member of her family. Guys, her workspace is INCREDIBLE. 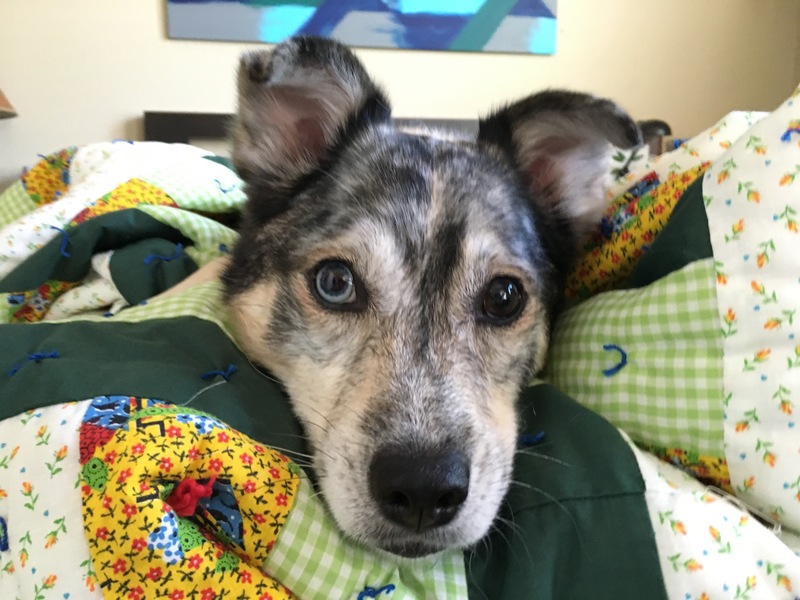 She’s got a smart-looking blog with great photography! 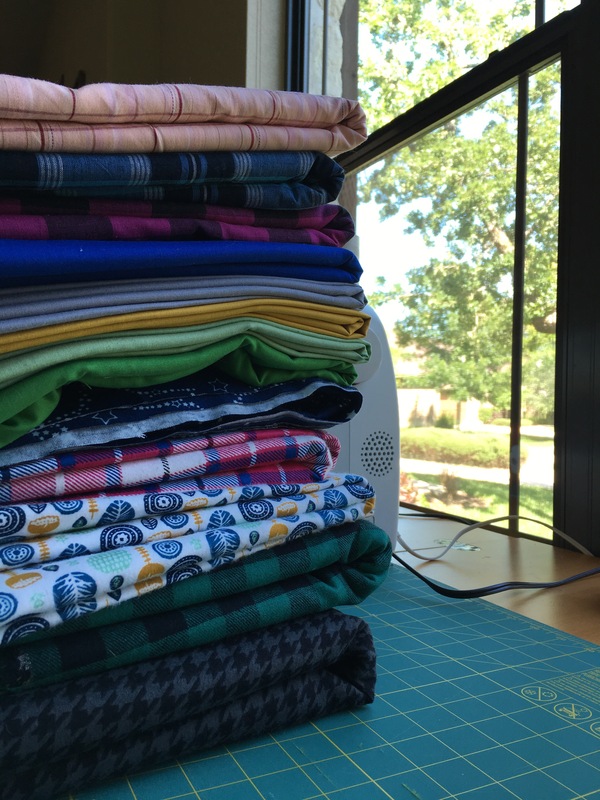 Speaking of workspaces, also be sure to stop by Jennifer at RV Quilting. Yup, you read that right — RV quilting! She does an amazing job of quilting on the road and has tons of great quilts to show. I especially love one made of recycled men’s shirts, and a modern mini drunkard’s path moonscape that you just have to see to appreciate. It has been so fun already discovering so many new, amazing quilters. 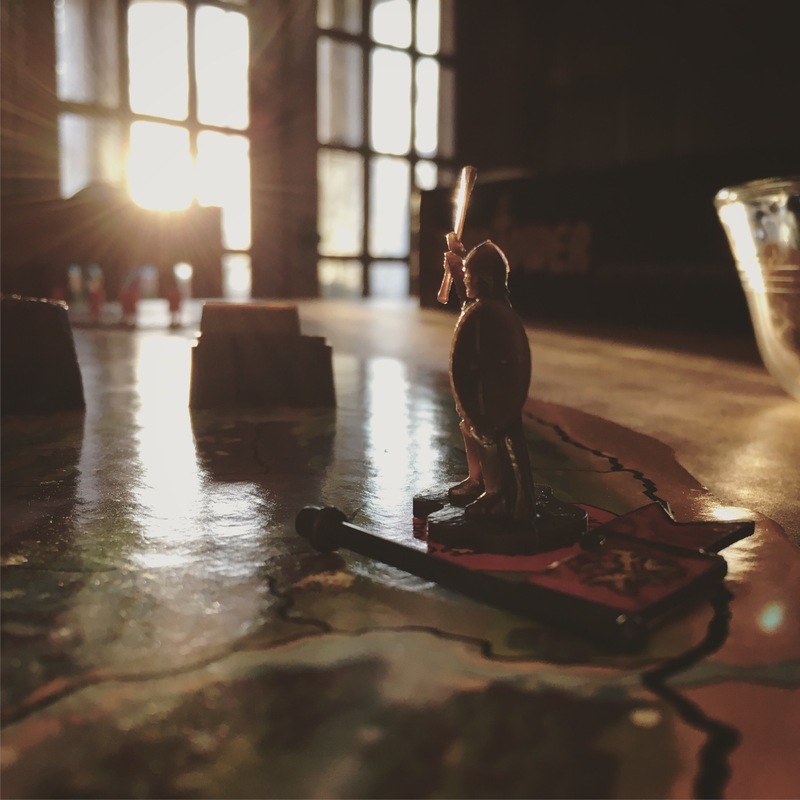 One of the things I have found to be difficult is that I usually cannot comment on blogs that are not on WordPress, so I’ve been posting these recaps to at least throw a link to my fellow blog-hoppers. As always, thanks to our inimitable host, Yvonne at Quilting JetGirl. Great giveaways again this week, so check out her post. 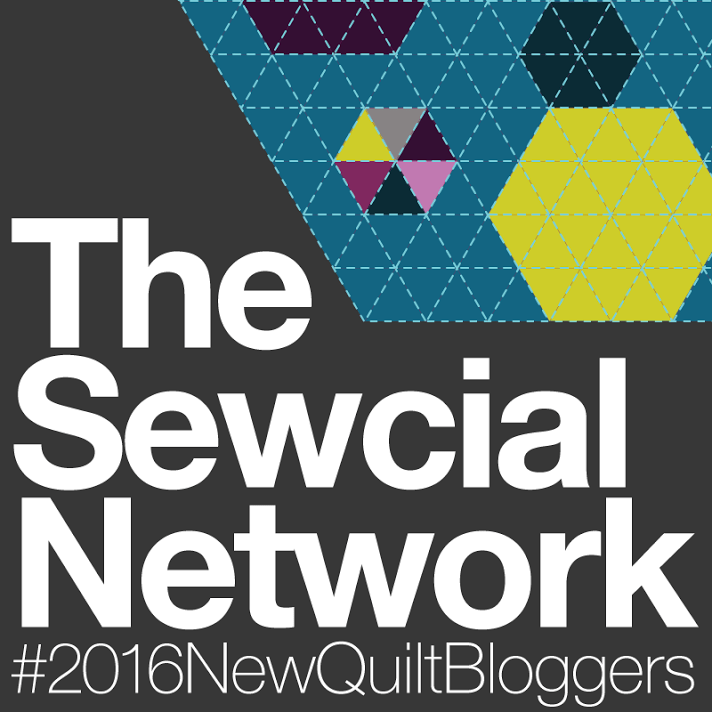 Y’all, it’s week 1 of the 2016 New Quilt Bloggers blog hop! I am so excited. 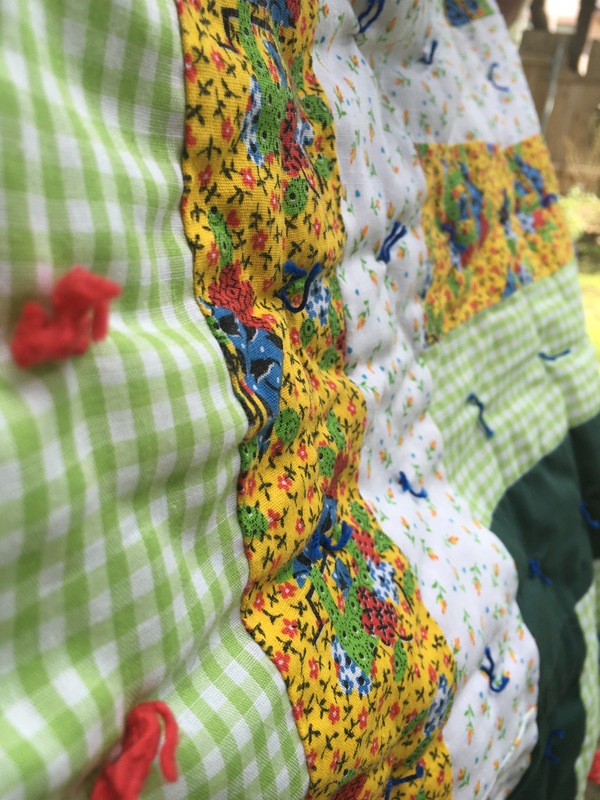 I am finding myself not to be much of a quilter or blogger these days, but what I have been for years and still am is a quilt blog reader FANATIC. I am subscribed to hundreds of quilt blogs. The thing is, they often have a shelf life. Someone posts regularly for months or years, and then life happens, or it becomes drudgery rather than invigorating. Posts taper off or disappear altogether. Last year I followed along on all the posts about this blog hop and dreamed of participating one day. Now I’m in it, and finding the process a bit intimidating, largely because the participants are AMAZING quilters and bloggers. So the good news is, lots of exciting new reading! So much to learn and see! Paige at Quilted Blooms – Paige has mad skills — from applique, to design, to maintaining a stellar website. I absolutely swooned over her Michael Miller glitz challenge quilt she shared in this post. Amazing. 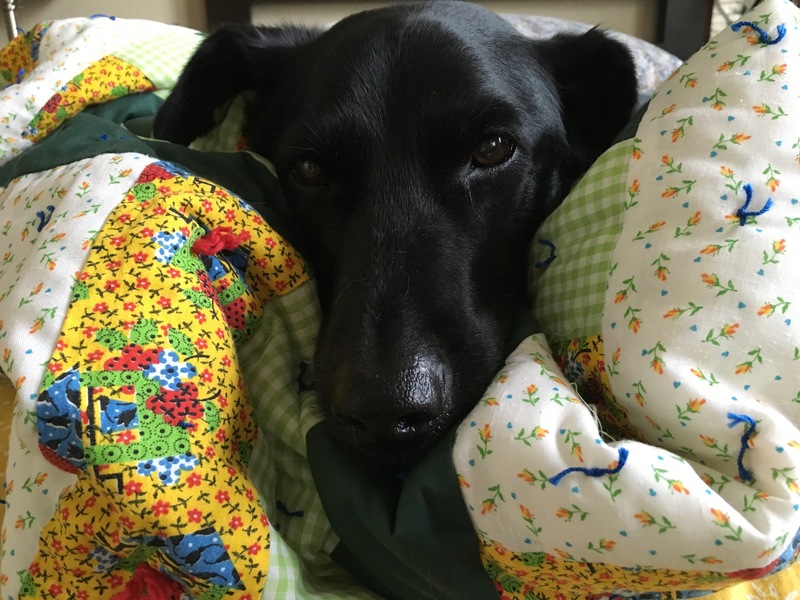 Melva at Melva Loves Scraps – “When life gives you scraps, make a quilt.” Can I get this on a throw pillow, please? I’m totally in love with her Broken Star quilt. Melva seems to put a lot of thought and care into her work, which I admire. Amanda at Gypsy Moon Quilt Co – Speaking of vintage beauties, you’ve got to check out what Amanda is up to here. Sustainable, beautiful, upcycled, thrifted amazingness. She also has a fun feature, Five Things Friday, where she shares five happy things + five happy photos. 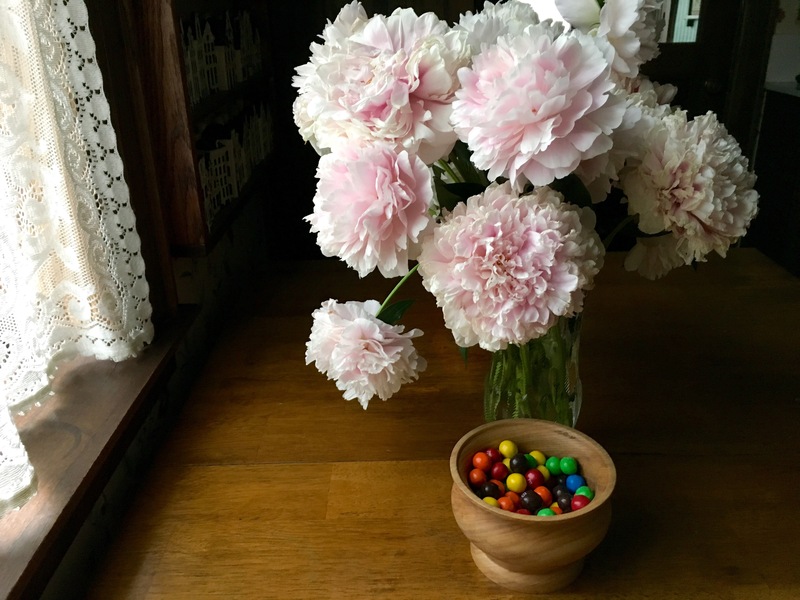 The world (and the internet) could use more happy, beautiful things like this blog. You know what they say happens when you’re busy making other plans? The baby has a sleep regression, you have an unexpected surgery followed by a major illness, the husband has to work out of town so you scramble to take care of things on your own, travel plans get rearranged (and re-rearranged), and, unfortunately, not much sewing or blogging happens. Passion, creativity, and self-confidence all wane. I wish I had pushed myself to write a bit more over the past few weeks. I’m not sure (because, are we ever?) but I think I’m making it to the other side of this period of chaos. 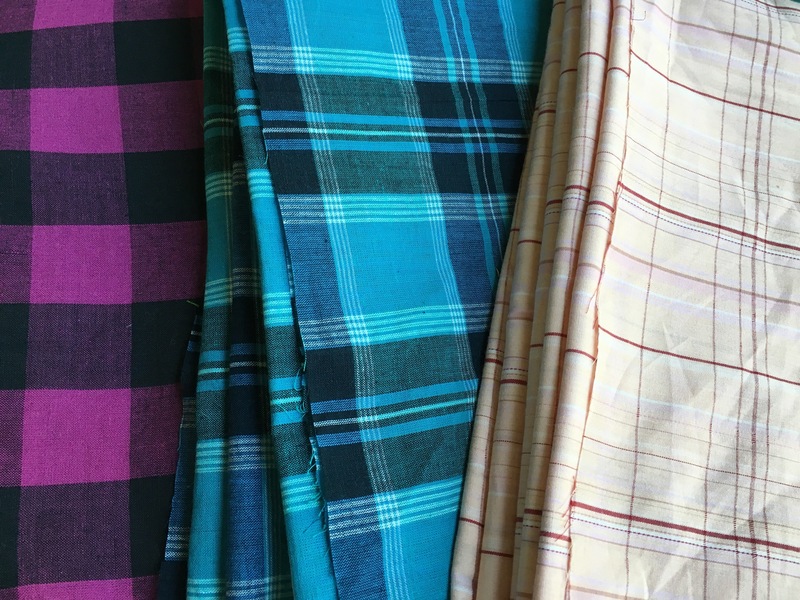 I have some posts planned (and many quilt ideas swirling about!) and hope to get to them soon. First this one, just to talk myself into getting back on the horse. 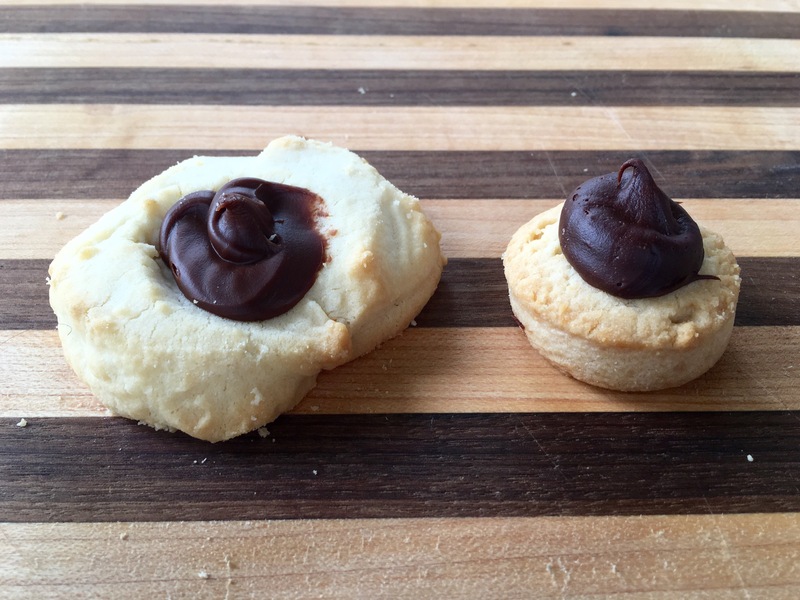 As a tiny and non-quilt-related delight, I’ll wrap with this: I’ve fallen back in love with a childhood favorite: black-eyed Susan cookies. I’ve also seen them called brown-eyed Susans, fudge thumbprints, and just Susan cookies. One of the fun things about having a hectic month is that we did lots of store-bought food. My two nearest groceries each sell a version of this cookie. 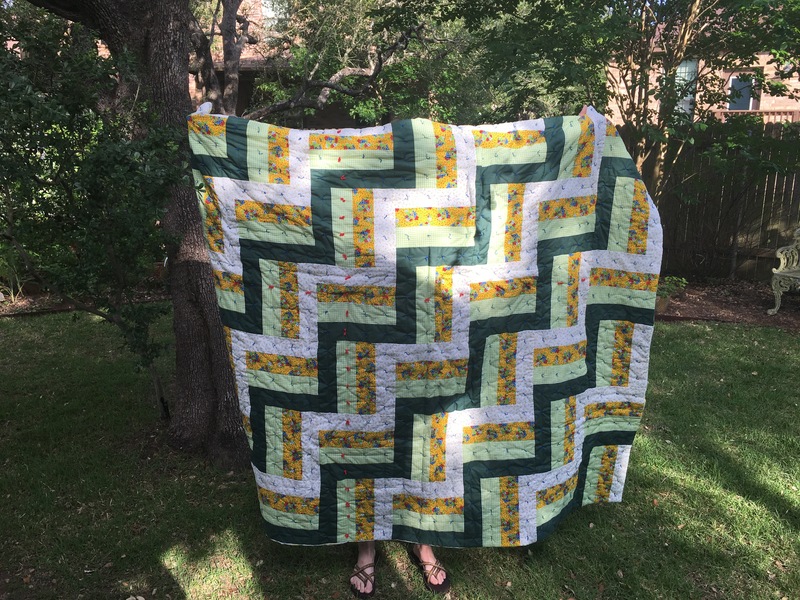 Happy to report that I did finally finish the Great Green Granny quilt! We’ve had some unexpected travels in the last week and a half. Turns out it is reasonably easy to work on tying a biggish quilt in a tiny car. 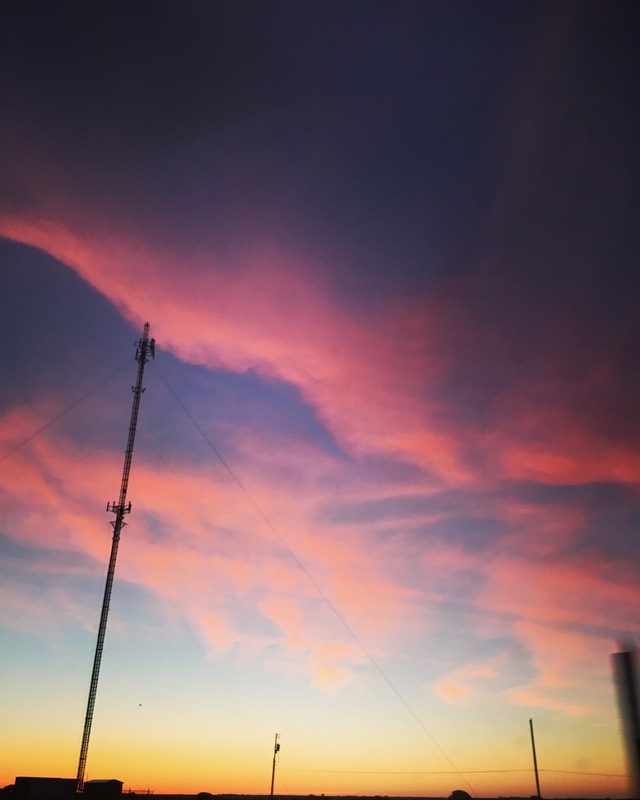 However, it is not easy for me to keep up with Internetting as much as I’d like while on the road. I mostly went with thin, blue ties. I had hoped to use red for a vintage/clashy look. My husband convinced me it would be overwhelming, and I’m glad he did. I think it would have been a bit much. But also, the red yarn is a medium weight and much harder to thread through the needle and punch through the fabric. I love my stripe and a half though. Have you tied a quilt? What do you like to use? I’d love any tips! 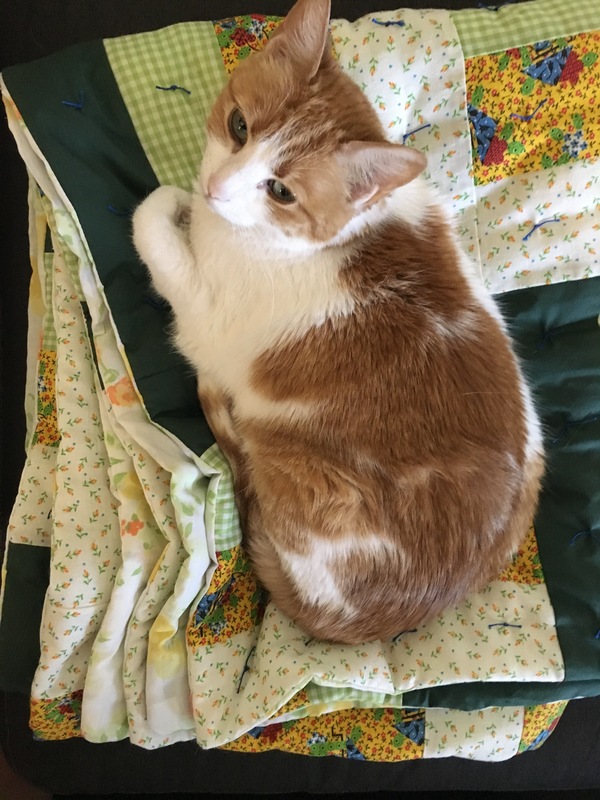 The quilt is a hit with people and pets alike. These pics are unposed and taken within 10 minutes of pulling the quilt out of the dryer. I was really hoping to have a finish to share today, but progress is slow on hand-tying the Great Green Granny Quilt. I am learning a ton, though. Like pay more attention to the quilting requirement of your batting if you don’t want to tie 672 knots. Good news is, progress is coming along and I do feel like I’m actually getting close. And I love how it looks. Animals seem to love how it feels, as they’re constantly snuggling up in it if I set it down for even a moment. 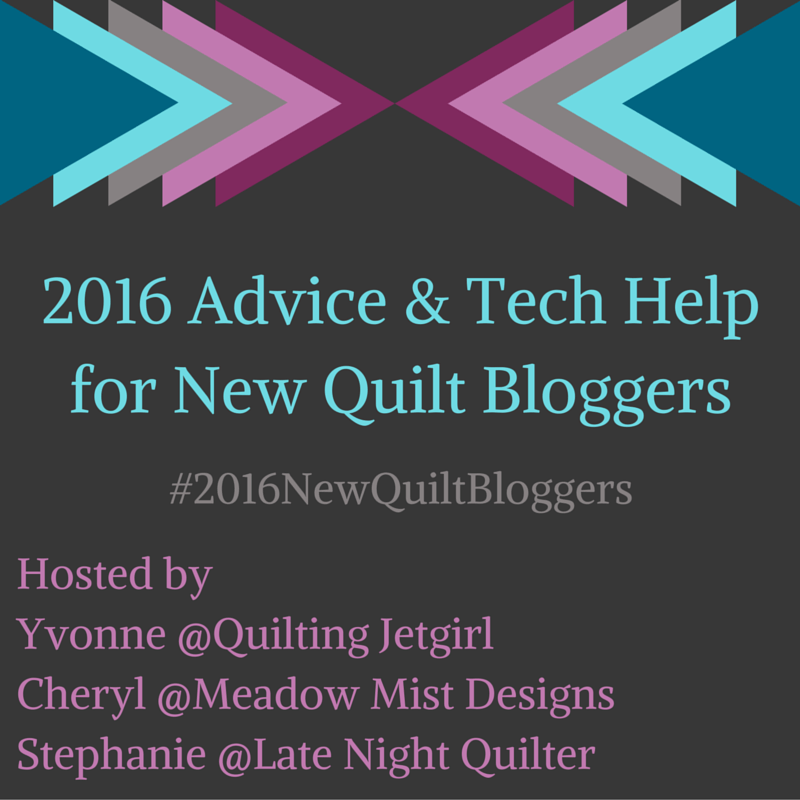 I am excited to be joining the 2016 New Quilt Bloggers Blog Hop! Many thanks to the hosts, Yvonne of Quilting Jetgirl, Cheryl of Meadowmist Designs, and Stephanie of Late Night Quilter. I am already learning a lot and finding great new blogs, and I’m only about 10 minutes into it. I think most participants have more quilting or more blogging experience (or both) than I do, but I’m not sure anyone can beat my prolific use of #UnnecessaryHashtags. A local fabric chain is going out of business. Their big loss is my big gain. I’ve never bought even close to this much yardage at once! 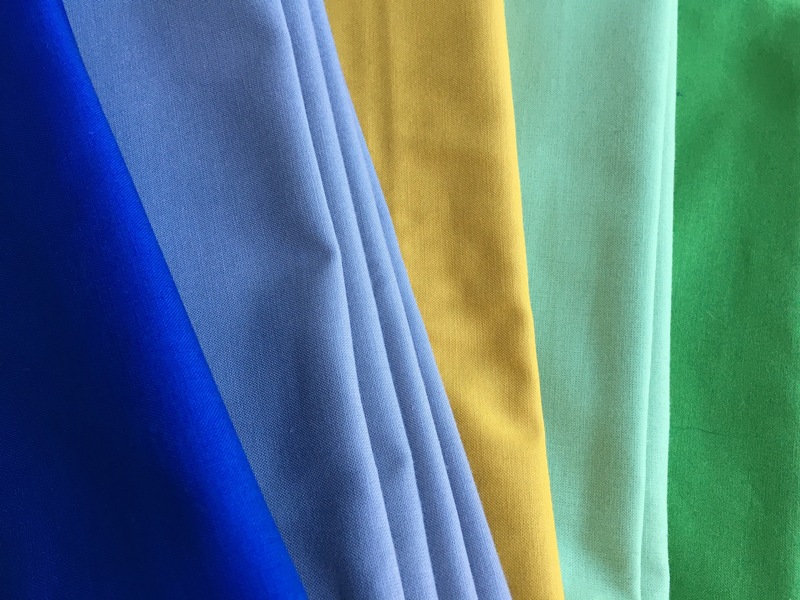 Best text from your partner you can get while fabric shopping: “Go nuts!” So I did, folks. So I did. Sometimes after a hectic week, it’s nice to slow down a bit. Or so I hear, from all the quilt bloggers who love hand sewing. Once again, I’m trying something new to me. 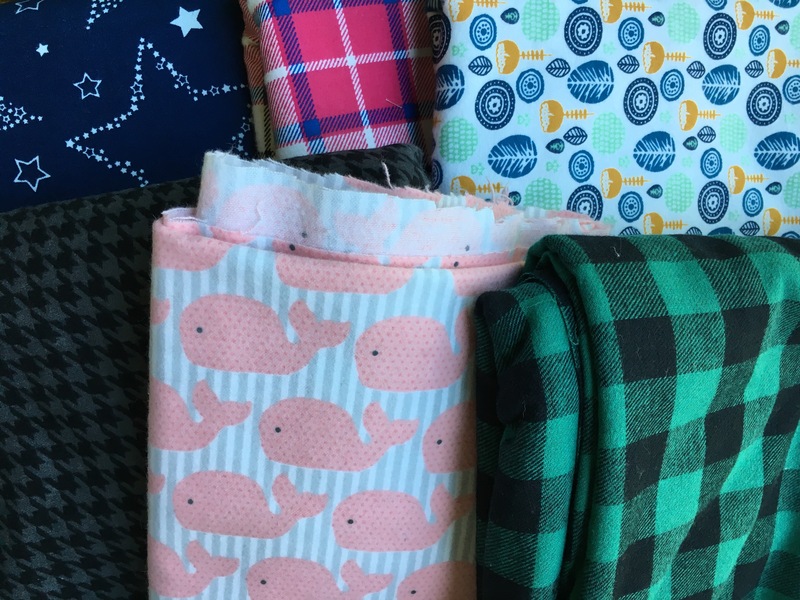 It’s amazing how even with my 8.5 quilts and two little baskets to my name (“I am 25.5 years old”)*, every new project has many new and challenging elements. It’s challenging. It’s good. And I actually am finding some hand-sewing to be relatively painless and meditative. Here I am, working away at the Great Green Granny Top. I have never hand-stitched anything before, and certainly never done a blind stitch. But I found this tutorial at Quilt Taffy (from 2008!). Bless the Internet. Sometimes I fancy myself a self-taught quilter and sewist, but the truth is, the lovely people of the web have taught me all I know. 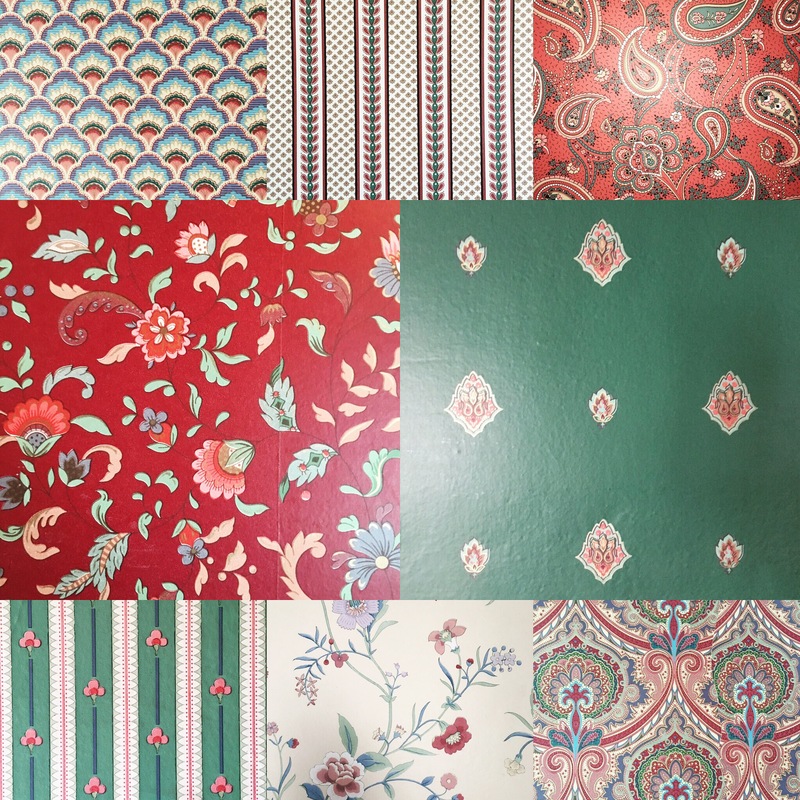 Am I totally alone in finding these great 1960s/1970s fabrics absolutely delicious? I do consider myself a modern quilter, but I don’t think that has to exclude a love of vintage. *I am not 25.5. Or rather I am, and then some. This is a reference to the wonderful terribleness that is Girls.